The Northern White Cedar carries the name “Grandmother Cedar,” and is considered a sacred gift to humanity due to its beauty and bountiful uses. Fireside Lodge uses the natural beauty of the white cedar to make a full line of white cedar furniture pieces. They grow the white cedar in a renewable forest and prepare and maintain it by hand. For the Cedar Round Counter Stool, the Northern White Cedar logs are hand peeled and crafted to accentuate their natural beauty. Only a clear coating is added for extra durability, including a liquid glass finish on the seat for preservation. 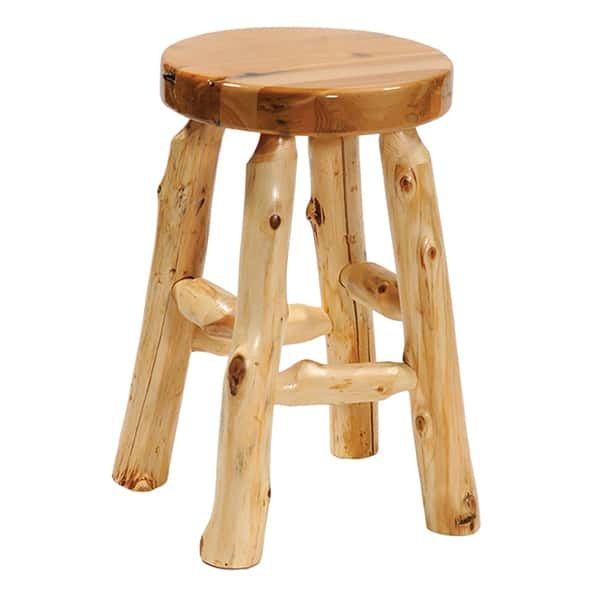 The Cedar Round Counter Stool is thick and sturdy like the cedar tree it comes from. If you’re looking for traditional, rustic, log cabin, and idyllic furniture, look no further than Family Leisure’s extensive collection of the cedar furniture by Fireside.